Summer is officially here at last! 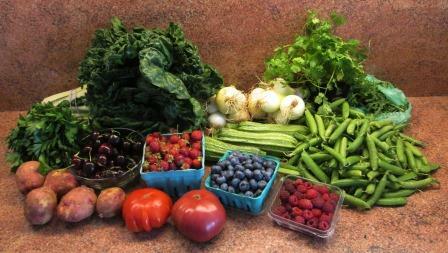 One happy concomitant of that is the increasing abundance of local fruits and vegetables at my Greenmarket. We’d invited a pair of friends to a dinner to celebrate the season, and when I did the shopping for it, a few days ahead, I went way overboard on my purchases: inescapable rapture of the season. Not everything shown here was for that one meal, but it all looked so good I couldn’t resist. And good it all was, too. 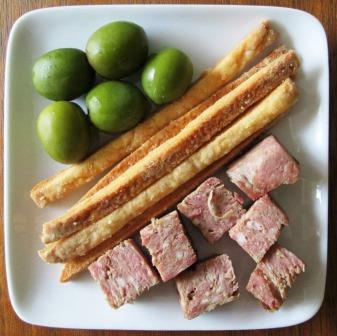 Our Italian-themed dinner party began simply, with a few Castelvetrano olives, cheddar cheese sticks (homemade), and cubes of country terrine (not homemade) to go with glasses of aperitif wine in the living room. 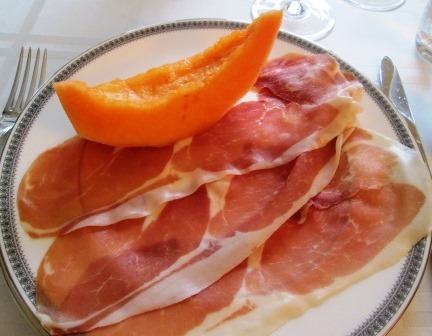 At the dinner table, we started with that quintessential summer antipasto, prosciutto and melon. It was pushing the season, but I had managed to find a single cantaloupe in the grocery store’s bin that actually smelled like a melon. Its texture was a little too stiff for full ripeness, but the flavor was right. 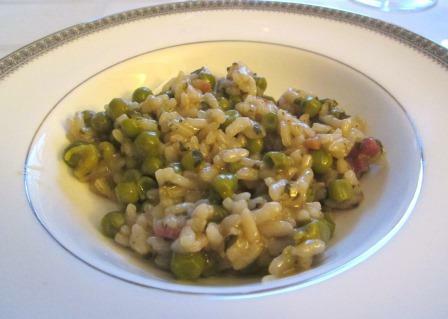 We went on to a primo of risi e bisi, another seasonal classic. This Venetian dish of rice and peas is a close relative of risotto. My version, from Tom’s and my cookbook The Seasons of the Italian Kitchen, includes pancetta in addition to the usual onion, parsley, broth, butter, and parmesan cheese. Quite a substantial dish, and just lovely with young, sweet English peas. Our secondo, also from that cookbook, featured a dish we call Summertime Lamb Stew. It’s lamb lightly braised with tomatoes, pancetta, and chopped aromatic vegetables. Normally it uses fresh plum tomatoes, but in June all we get are greenhouse-grown, so we made it with canned San Marzanos. 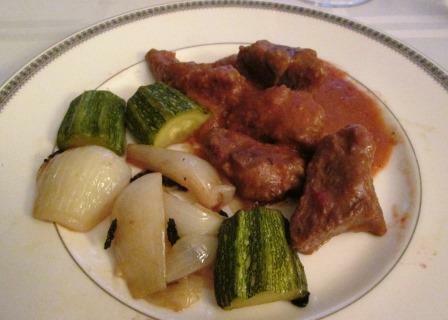 Sautéed early zucchini and spring onions, lightly scented with mint, made fresh, flavorful companions to the lamb. 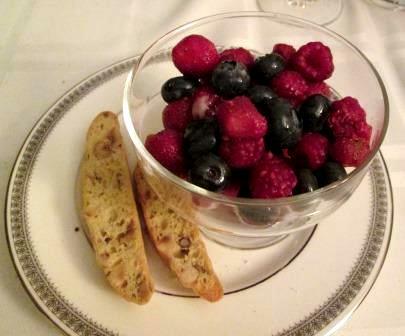 After a cheese course (which I failed to photograph), we finished with a dessert of raspberries, strawberries, and blueberries in grappa – a recipe from Tom’s and my first cookbook, La Tavola Italiana – and hazelnut biscotti baked and brought to us by our guest Joan. This was as light and refreshing as you can imagine – a perfect palate cleanser of a dessert. 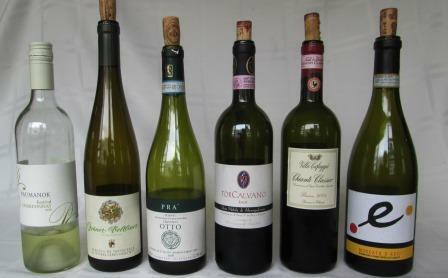 I hasten to point out that the four of us did not finish all six wines that evening. In fact, we didn’t finish any of them – just enjoyed the pleasure of tasting the differences from one to the next with each course. They were still fine the next day, as Tom and I feasted on the leftovers. 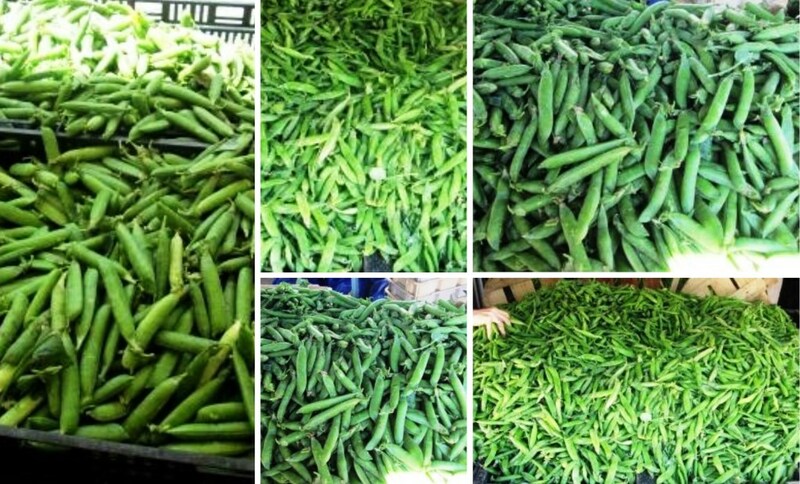 It’s high season for peas in my Greenmarket, and I’ve been buying them as fast as I can. 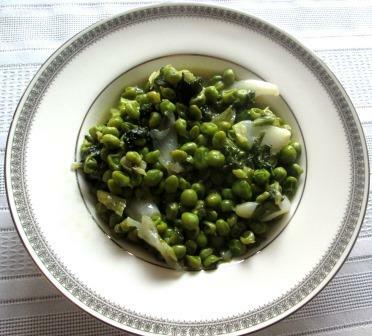 I should mention that for me “peas” means shelling peas, or English peas: My household has no interest in sugar snaps. Standing together at the kitchen counter shelling peas is a pleasant summer tradition for Beloved Spouse and me. I used to buy peas in quantity, blanch them and freeze them for year-long use, but they always came out tasting like commercially frozen peas, not the tender-crisp sweet vegetable that truly fresh ones are. Now I buy only enough for one or two days’ dinners at a time, so they can be eaten quickly, before the sugars turn to starch. The first simplification was the lettuce. Julia calls for quartered heads of Boston lettuce, wound around with string to keep them in shape during the cooking. As you see, I simply shredded leaves of fresh Greenmarket leaf lettuces. Second was the onions. Julia wants one-inch green onion bulbs or small white onions parboiled for five minutes. I had a larger onion – so fresh it didn’t need peeling – so I quartered it and gave it the parboiling. The cooking began in Julia’s manner. I brought butter, a little water, sugar, salt, and pepper to a boil in a pot, put in the peas, and stirred them around. Then, instead of burying a bunch of fresh parsley stems tied together with string in the middle of the peas, as she says, I sprinkled on chopped parsley. 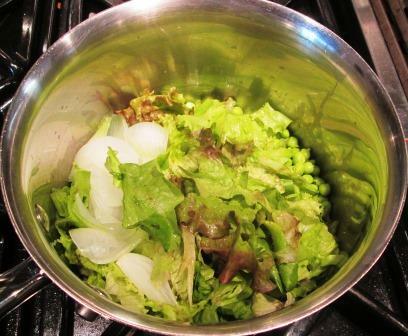 Instead of arranging lettuce quarters over the peas and basting them with the liquid, I just strewed on the chopped lettuce and followed with the onion quarters (already falling apart, but no matter). So that the cooking steam will condense and fall back onto the peas, invert a lid over the saucepan and fill it with cold water or ice cubes; or use a soup plate. Bring the peas to the boil and boil slowly for 20 to 30 minutes or until tender. 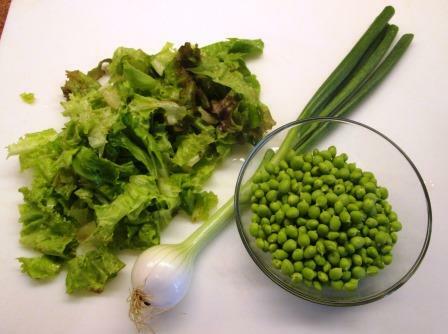 Several times during the period, remove the cover and toss the peas and vegetables to insure even cooking. As the water warms and evaporates in the cover or soup plate, refill with ice cubes or cold water. I couldn’t see why a snug-fitting normal lid wouldn’t circulate steam as well as that Rube Goldberg contraption, so I just put a low flame under the pot, covered it tightly, and simmered for 20 minutes, checking and stirring once or twice. It worked perfectly well. When the peas were done, most of the liquid was gone, but that’s what the recipe said would happen anyway. So why take all that trouble? I briefly raised the heat to boil down what remained, and transferred everything to a serving dish – skipping an indicated final dose of softened butter. That would’ve been gilding the lily. The dish isn’t glamorous, but it is absolutely delicious. The flavors blend in a rich harmony. For me this is indeed the glory of pea cookery – and done in the easiest possible way. Readers who are familiar with my blog know that I don’t write only about my successes. If I try a recipe and it doesn’t work, I say so, and go on to consider why it didn’t: Was it my fault or the recipe’s? And what can I learn from the experience? Today’s post is about two such non-successes. 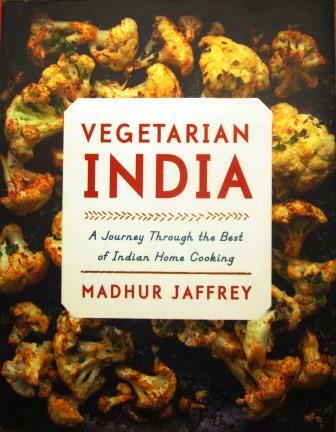 Unfortunately, these are recipes from an author I respect and a book of hers with which I’ve previously had very good results: Madhur Jaffrey’s Vegetarian India. It happened that I would be dining alone one recent evening, Beloved Spouse being out for a business dinner, so I could indulge my predilection for chicken. To liven things up a little, I thought I’d accompany my two broiled chicken thighs with a simple Indian vegetable dish and precede them with an Indian appetizer. Here’s how that worked. This recipe looked like an attractive way to spice up humble vegetables. The cooking time seemed extremely brief for carrots, but I wanted to give the recipe a chance. So I defrosted half a cup of good tiny peas, cut a raw carrot into half-inch dice, and proceeded to measure out one-quarter of the indicated seasonings. That last bit was the killer, as I feared it would be. After 4 minutes, the pan was dry, the peas were looking worried, and the carrots were still rock-hard. I kept adding small amounts of water, but it took almost 10 more minutes before the carrots were pierceable with a fork. And by then the peas were pretty mushy. 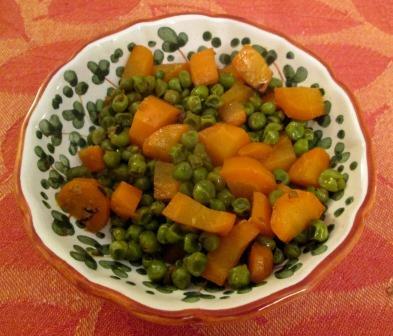 The dish wasn’t a disaster: The peas and carrots were edible, and tasty enough in themselves. But neither vegetable had a proper texture – one still too firm, the other too soft – and the spices were barely discernible. Maybe they’d have been more prominent in a shorter cooking time, but then I would have had raw carrots. Maybe I should have used a very young, tender carrot, instead of the mature one that I had, but the recipe didn’t specify age – and even so, carrots don’t cook fast. If I ever try this recipe again – and I might, because I do like the concept – I’ll probably parboil the carrots and double the spices. The only spices involved in the preparation are turmeric, red chile powder, salt, and black pepper – not what I’d thought of as enough to consider a curry. But Jaffrey says the dish is “beloved in the Telangana region of Andrha Pradish,” so who was I to cavil? Once hard-boiled and peeled, the eggs are to have deep longitudinal slits cut in them – presumably to let the spices sink in. 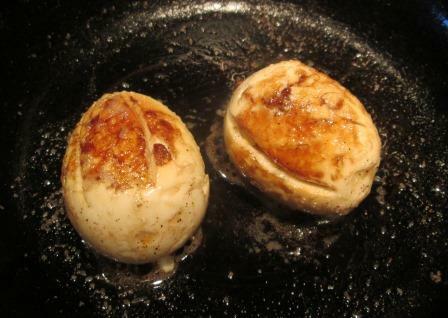 Ghee or butter is heated in a small frying pan; the spices are stirred in; then the eggs, which are to be rolled around “for about a minute, or until they are golden.” Serve right away. Pitiful. At that point I thought I’d better take them off the heat before they turned to leather. When I cut them open, none of the color had seeped in through the slits, nor had any of the spice flavors. 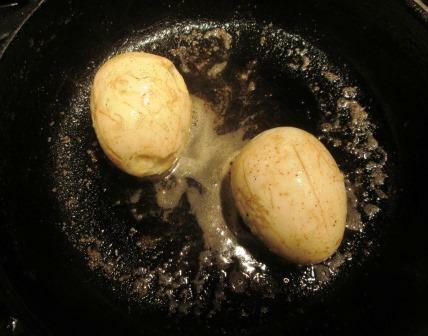 Just plain HB eggs, with a toughened outer skin. I ate them for my appetizer anyway, but they weren’t worth even the minor effort they took. 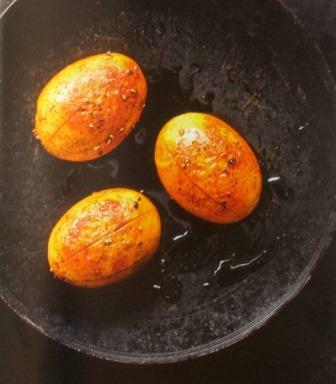 I wonder if the color of the eggs in the book’s picture was due to Photoshop. Either that, or there had to be some drastic errors in copyediting or proofreading the recipe. Those could also apply to the timing given for the peas and carrots, as well as the spice quantities indicated in both recipes. Improbable, but what else could it be? There was the possibility that my spices were too old and had lost their power. But that wasn’t it: When checked afterward, they were fully as aromatic as they ought to be. Leaving aside why these recipes didn’t work, the lesson I need to learn from this experience is to put more faith my own culinary instincts. (Soft cheers in the background from Tom, who has been telling me this forever.) I knew carrots need longer cooking; I’d been surprised by the tiny quantities of spices called for; and I couldn’t see how flavors could permeate eggs in one minute. I should summon the courage to make my own changes in cases like this. As in every other field, just because something is in print doesn’t mean it’s right. 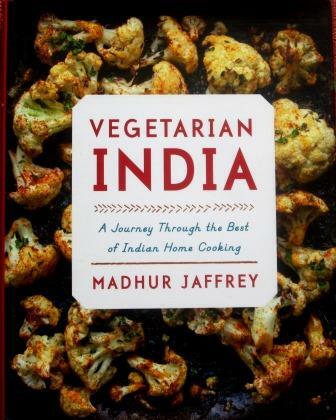 An early Christmas gift from my friends Bruce and Joan was Madhur Jaffrey’s Vegetarian India: A Journey Through the Best of Indian Home Cooking. It’s a big handsome book, with gorgeous color photographs. I was immediately drawn to many of the recipes and couldn’t resist trying a few right away. I settled upon two of the simpler ones: a mushroom curry and a dish of peas and potatoes, to be served as a weeknight dinner for two, along with a pair of very un-Indian, un-vegetarian Cajun andouille sausages. A quick trip to the great Indian grocery store Kalustyan provided what was lacking in my pantry supplies: not very much, I was pleased to realize. All I absolutely needed for these recipes were the mushrooms and a piece of fresh ginger – though once in the store I picked up several things for use in future recipes. And so home to cook half recipes for two. 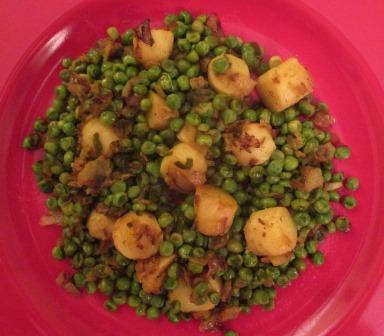 For Peas and Potatoes Cooked in a Bihari Style, I started in the afternoon by boiling, cooling, peeling, and dicing three fingerling potatoes; also defrosting a generous cup of small green peas. Toward dinner time I prepared and measured out all the other ingredients, because from that point the cooking had to proceed quickly. A little oil in a nonstick frying pan got me started. 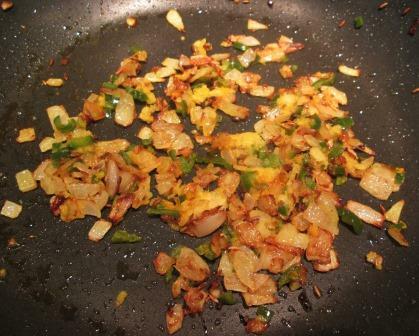 In it I sizzled whole cumin seeds for a few seconds, then stir-fried half a chopped onion until it was soft. 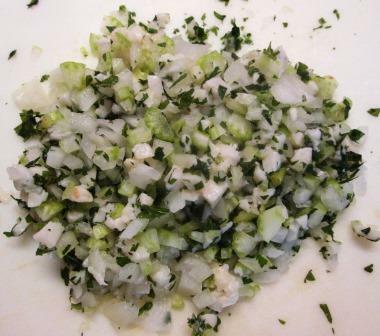 Finely grated fresh ginger, a finely chopped hot green chili (a serrano, but who’s checking? 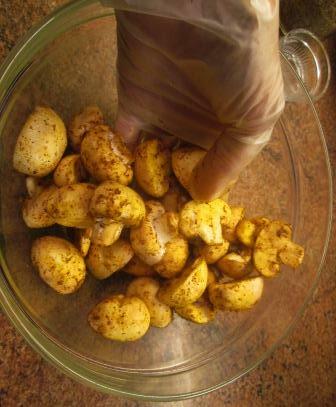 ), and ⅛ teaspoon of turmeric went in next, for just one minute. 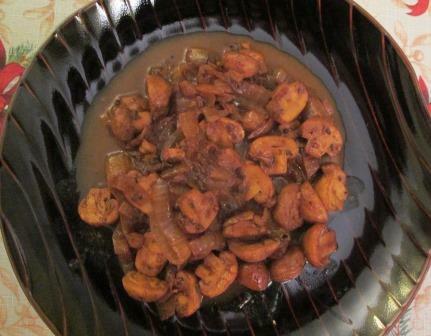 Jaffrey’s Simple Kodava Mushroom Curry was indeed comparatively simple to make, as Indian curries go. I started by rubbing salt, turmeric, and chili powder (Mexican, but again, nobody’s checking) into half a pound of white mushrooms – wearing a plastic glove as the author suggests, to keep turmeric stains off my fingers. While the mushrooms sat for a while to absorb the spices, I set up the other ingredients: whole brown mustard seeds, a chopped hot green chili, ¼-inch half rings of onion, and freshly ground coriander seeds. Each of those flavorings went in succession into a little oil in a hot frying pan. Next into the pan came the mushrooms, which I stir-fried for a few minutes, mixed in a little water, covered, and simmered for 10 minutes. That was all: The curry was ready. Both the vegetable dishes were highly successful, and both went well with grilled sausages. The peas and potatoes were fairly mild tasting, delicately imbued with their mixture of spices. The mushrooms were more robust, with a lively touch of fire from their different set of spices. Both were nice textural counterpoints to the grilled andouille. Our palates were soon tingling with the flavors of this unusual pre-Christmas dinner. Not our traditional run-up to the holiday, but thoroughly enjoyable. 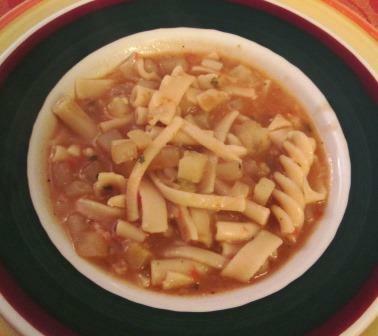 As a title, “Soups Roman Style” doesn’t have quite the cachet of “Marriage Italian Style” and “Divorce Italian Style,” those two mordantly comic films of the ‘60s, but in fact the Roman style of cooking produces some very interesting soups. 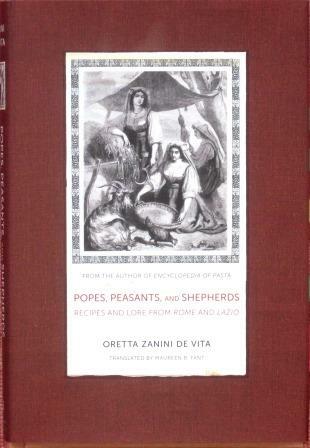 I’ve recently made three traditional ones from Popes, Peasants, and Shepherds, Oretta Zanini de Vita’s book of recipes and lore from Rome and Lazio. All three soups draw an underlying flavor from similar base ingredients, starting with a battuto of pork fat, onion, celery, and parsley, chopped together. In each case, after a scoop of battuto is rendered out in the bottom of the soup pot, a small amount of tomato ­– fresh, puree, or paste – is added and cooked briefly. The main liquid is vegetable broth or water. And each soup is finished with a generous dose of grated pecorino cheese, which Rome and points south use much more frequently than they do parmigiano. So much for the similarities: The other ingredients in each one made these soups quite different from one another. Our household really likes a dish of pasta with potatoes. It’s a combination that Americans often think odd – starch and starch! – until they taste it. 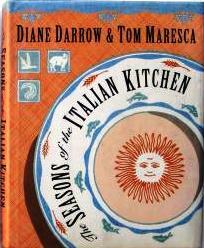 I’ve enjoyed versions from several regions in Italy and even published one of my own (in my dear departed mini e-cookbook Not the Same Old Spaghetti Sauce). This Roman version is another good one, and very easy to make. I stirred quarter-inch cubes of russet potato into the battuto-tomato base, added broth and freshly ground pepper, and simmered until the potatoes were just tender. Then I stirred in a batch of mixed odd bits of soup pasta and continued cooking until they were done. Finally I stirred two tablespoons of grated pecorino right into the soup. Between the cheese and the rather salty broth (I had used vegetable bouillon cubes), no extra salt was needed. This was a hearty, sturdy soup. More so than any other pasta with potatoes recipe I’ve tried, it had something ineffably Italian about it. I guess that’s the effect of the battuto. Everything blended into a comforting single flavor, given palatal interest by the different textures of potatoes and pasta. We enjoyed it very much. 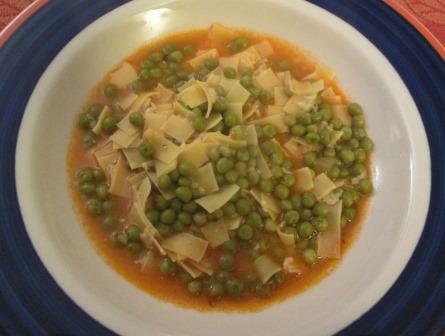 In this recipe, fresh peas take the place of the preceding recipe’s potato; small squares of egg noodles are used instead of dry pasta; and the liquid is water, not broth. This being November, I had to use defrosted peas, but they worked quite well. Again, I’d stirred about two tablespoons of pecorino into the soup pot before serving. This was a much more delicate soup than the previous one, with the almost solo voice of the peas sustaining it. The pecorino wasn’t a strong presence in itself, but it nicely moderated the sweetness of the peas. It felt like a springtime soup – as of course it would have been, in Italy. Here the main ingredients are rice and chicory – curly endive. If that second recipe was a spring soup, this one is definitely fall or winter fare. There was no chicory in any of my local markets this week, but I was able to make it with its nearest relative in the endive family, escarole. The greens had to be boiled, drained, squeezed, and chopped before going into the soup pot for a few minutes’ sauteeing with the battuto and tomato. Then I stirred in the rice and broth and simmered until the rice was tender. This time, the grated pecorino wasn’t to be stirred into the soup as it finished cooking but rather sprinkled on the individual bowls. This was a pleasant, mildly flavored soup (escarole being less bitter than chicory), but at the same time comforting and filling – good, hearty, chilly-weather food. The rice took up all the broth so quickly that I had to add quite a bit of water to keep the mixture from almost solidifying. I don’t know whether that might have been because I had on hand only American long-grain rice, not the short-grain riso comune, which Italy prefers for soup. I also had to reduce the proportions of all the solid ingredients in all three recipes. 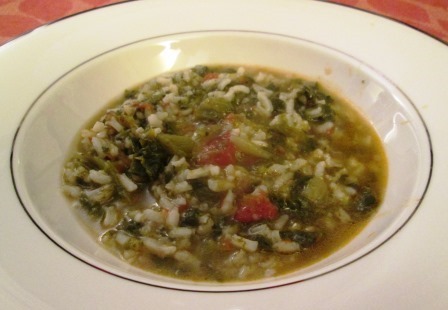 An Italian minestra can be made to various degrees of thickness, from a truly soupy substance to what is almost a moistly sauced bowl of pasta or risotto. These recipes were heavily weighted toward the vegetables, pasta, rice, and pecorino. I was making half quantities of recipes indicated as serving four persons, and even with those reductions, my soups easily fed the two of us twice. It did make me wonder if the English translator, who claims to have made adjustments for an American readership, had ever actually made these dishes herself. I may be becoming a crank on this subject, but too many recipes published today seem not to have had either proper editing or proper testing, making them recipes for failure. In the long run, that may make a lot of beginning cooks give up on the task of preparing their own food – and that’s a small but sad crime against humanity. In the Spring, a cook’s fancy lightly turns to thoughts of . . . Lamb. 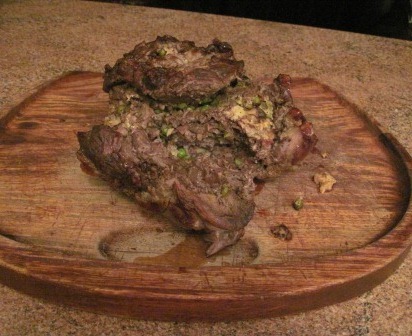 Especially around Easter time, a leg of lamb makes a fine centerpiece for a spring dinner party. It’s not always easy to roast lamb to every diner’s taste, however: Some people like it rosy-rare, others will eat it only well-browned. Lucky the cook whose roast comes out of the oven with just the right proportion of each! The stuffing is a savory mixture of bread, onion, fresh or frozen green peas, dried and/or fresh mushrooms, prosciutto, optional liver (lamb’s or calf’s), grated pecorino romano, olive oil, egg, salt, and pepper. Once the lamb is stuffed and trussed, you put it in a casserole, dot some butter on top, cover and set in a moderate oven for two hours. No turning, no basting, no need even to look in at it; it totally takes care of itself. It would probably work in a slow cooker, as well, though I’ve never tried that myself. Sewing the stuffing into the lamb may sound bizarre, but there’s a reason for it. Ideally, for stuffing purposes you’d want a rectangular slab of boneless meat, uniform in thickness. Given a lamb’s anatomy, that’s impossible. We have our butcher bone the leg for us, and we still need to open up some flaps on the meat to make it rollable. The resulting shape is highly irregular. If you don’t have or don’t want to use a darning needle and heavy-duty thread, you can tie the meat with string, but it needs a lot of string! I did it that way this week: My slab of meat was so irregular that the only way to enclose the stuffing was to form a sort of giant canteloupe shape, secured with five or six “ribs” of string. If you do it this way, it’s important that you cook it solid side down, knot-side up, so the stuffing doesn’t leak out. Honesty compels me to say that this dish doesn’t make for a glamorous presentation. This time, when the strings came off, the meat promptly flopped open and spread apart. It’s a roast to carve in the kitchen, not at the table! Despite how humble it looks, this is really a delicious dish – if I do say so myself. And I don’t have to, because my guests always say so too. And since it’s my own recipe, I can give it to you without violating anyone else’s copyright. Here it is, slightly streamlined from the book’s version. This week, I felt like making something French. 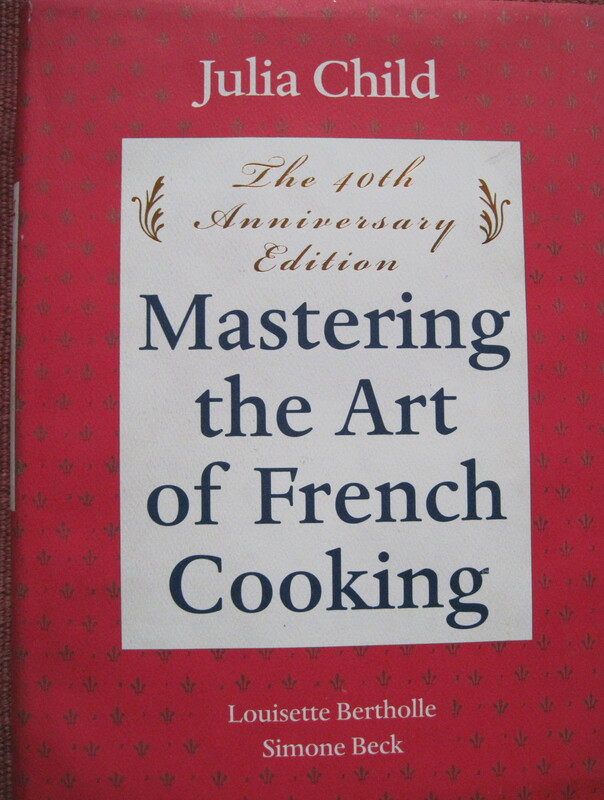 Considering my cookbooks, my eye fell upon the Cooking of Provincial France volume of the Time-Life Foods of the World series. Back in the ‘60s, I hardly knew who those people were, though now they’re among the tutelary deities of the American kitchen. I read through the whole text again with great pleasure, albeit with wry amusement about how many things Ms. Fisher had to explain to Americans about French food back then, so many of which we now take for granted. 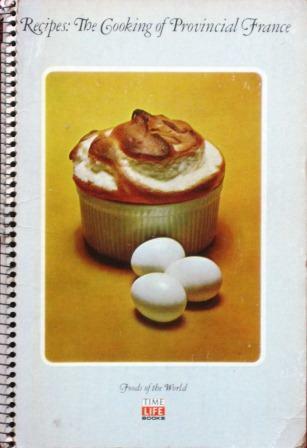 And I remembered how several of the book’s recipes became – dare I use the word? – iconic dishes for me. But there were still some recipes in it I’d never tried, so I chose a rib-sticking winter dish, Potage Purée de Pois Cassés. 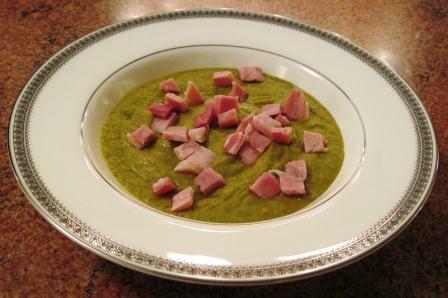 Now, split pea soup is not an exclusively French dish. I imagine versions of it are made in any part of the world where peas are grown and dried. But the French do have their own way of doing things. You must understand, I was coming to the recipe after years of enjoying my husband’s split pea soup. (Tom is our house’s inventive soup maker.) His version uses dried peas, a bit of minced carrot and onion softened in bacon fat, a smoked ham hock, and water. It’s very easy, and we’ve always been happy with it. This book’s split pea soup is something else. To begin with, I had to boil the peas in chicken broth with a bouquet garni and a ham bone. Separately, in fat that had to be freshly rendered from salt pork, I sautéed lots of carrots, onions, leek, and lettuce leaves. 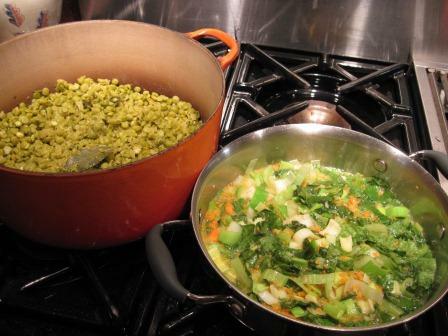 As you can see, the mass of those vegetables was almost equal to the volume of the cooked peas. I added them, along with fresh (from the freezer) green peas, to the pot with the split peas, cooked it all some more, and passed the mixture first through the medium blade of a food mill and then through a fine sieve. Why the labor-intensive double straining? Because the leafy greens (I used Romaine) don’t simply dissolve as the other vegetables do, and the French apparently don’t like vegetation streaks in their pea soup. After a final reheating, the soup had to be finished with many cubes of baked ham, salt, pepper, and still more butter. It was outrageously rich. But it wasn’t as strongly pea-y as we’re used to – more like a velouté of vegetables. Extremely good, but I really like the flavor of split peas in soup. And it was a huge amount of ham. I wondered if provincial French housewives really went to that much effort for what’s normally an everyday family soup. This seemed more like a restaurant dish – or at least, something to be served at a special dinner for guests. Also, I found some of the recipe instructions odd. For instance, those other vegetables were to include “two chopped celery tops.” What is a celery “top” – the leaves from a single stalk? the leaves from a whole head? Surely not the whole head itself, as opposed to the celery root, which is how the words could be construed. Leaves seemed the most plausible answer, but the celery I can buy in winter markets rarely has much foliage at all. So I was perplexed. Then, there was no indication that the soup should be stirred at any point during the several stages of cooking. Anyone who makes split pea soup will know how it loves to behave like Vesuvius erupting if it isn’t stirred down regularly – not to mention how it sneakily burns on the bottom of the pot. I think recipe writers owe it to their readers to warn about things like this. Finally, there was nowhere near enough liquid in the recipe. For two cups of dried peas it wanted only five cups of stock. At the end, the recipe said “If the soup seems too thick, thin it with a little chicken stock or water.” Seems? Were they kidding? Without more water in the first boiling, my peas would have turned into the consistency of ready-to-set plaster of Paris. In all, I had to add about another quart of water to keep the soup liquid. None of this was a disaster; I could see what needed to be done differently and did it, no matter what the recipe said. But not everyone might be able to do that, so I had an unhappy feeling that the author might have had at least a few toes of clay. Or, in charity, maybe it was just an editor trying to keep the instructions short enough not to intimidate readers back in the ‘60s. The culinary world has changed mightily since then, and at least some of the change is to the good. In any event, interesting as the soup was, for everyday use we’ll probably stick with Tom’s recipe. I had him write it down for the first time ever; here it is.